These kind of perfect winter days always ends up screaming one thing to me when I am out with my camera – get out your infra-red filter and start shooting the world as the human eye can’t see. It’s something I particularly love about infra-red photography, whilst this spectrum of light does actually exist, we as humans can’t actually see it. I am going to try and keep the technical blurb out of this blog for as long as possible, I would prefer it to be about the images rather than how they were made. This photo was taken just last week in the wide open plains near the Popes Cross, I was actually on my way over to the Popes Cross as it was perfectly lit up with late afternoon winter sunshine. I never made it that far, this kind of thing happens to me quite regularly, I stop to shot something else and then an hour later the sun has gone and its time to head home. I like the effect of the walkway in the grass, it looks like some kind of alien entity making its way towards the trees. 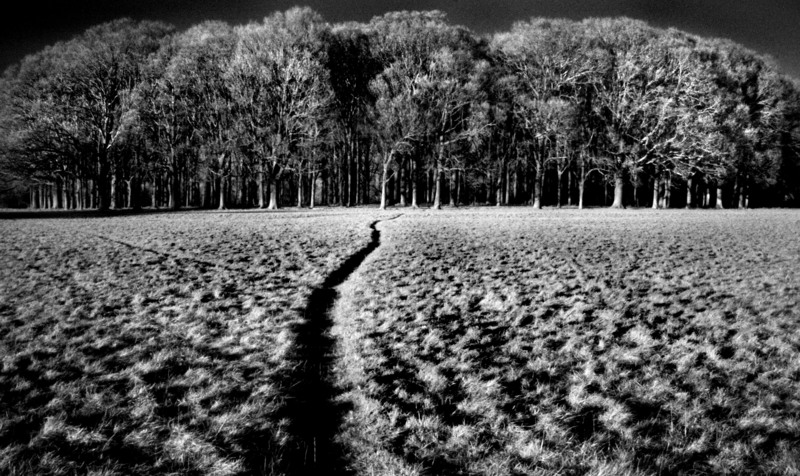 This entry was posted in Black and White Photography, Infra-red Photography, Irish Landscapes, Phoenix Park. Bookmark the permalink.